Yosef Kaplan is Bernard Cherrick Professor of Medieval and Modern Jewish History and Director of the School of History at the Hebrew University of Jerusalem. He has published extensively on early modern Jewish history and on the western Sephardi diaspora; his most recent book is An Alternative Path to Modernity (2000). Raphael Loewe was formerly Goldsmid Professor of Hebrew at University College London, having previously taught at the University of Leeds and held a research fellowship at Gonville and Caius College, Cambridge and a visiting professorship at Brown University in Providence, Rhode Island. 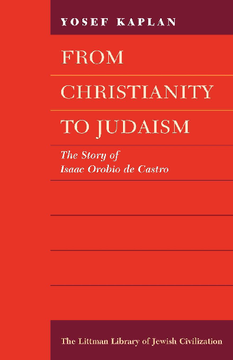 His publications concern various aspects of Judaism in late antiquity and the Middle Ages, and include much translation. His English translations of a substantial number of liturgical poems for the Passover season are contained in his Rylands Haggadah (1988), and others—among them the Royal Crown—in his Ibn Gabirol (1989). His translation of FitzGerald’s Omar Khayyám into medieval Hebrew verse was published in 1982. He is also a contributing author of the companion volumes to the facsimile editions of the Barcelona Haggadah (1992), the Rothschild Haggadah (2000), the Parma Psalter (1996), and the North French Miscellany (2002). Many other translations remain unpublished, being privately circulated among friends.